The definitive history of the successful battle to halt the AIDS epidemic—from the creator of, and inspired by, the seminal documentary How to Survive a Plague. Not since the publication of Randy Shilts’s classic And the Band Played On has a book measured the AIDS plague in such brutally human, intimate, and soaring terms. In dramatic fashion, we witness the founding of ACT UP and TAG (Treatment Action Group), and the rise of an underground drug market in opposition to the prohibitively expensive (and sometimes toxic) AZT. We watch as these activists learn to become their own researchers, lobbyists, drug smugglers, and clinicians, establishing their own newspapers, research journals, and laboratories, and as they go on to force reform in the nation’s disease-fighting agencies. With his unparalleled access to this community David France illuminates the lives of extraordinary characters, including the closeted Wall Street trader-turned-activist, the high school dropout who found purpose battling pharmaceutical giants in New York, the South African physician who helped establish the first officially recognized buyers’ club at the height of the epidemic, and the public relations executive fighting to save his own life for the sake of his young daughter. Expansive yet richly detailed, this is an insider’s account of a pivotal moment in the history of American civil rights. 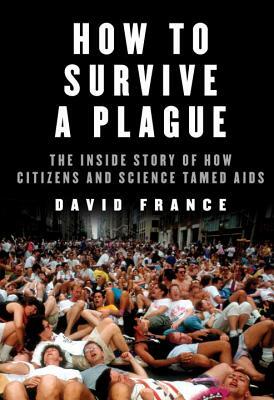 Powerful, heart-wrenching, and finally exhilarating, How to Survive a Plague is destined to become an essential part of the literature of AIDS. DAVID FRANCE is the author of Our Fathers, a book about the Catholic sexual abuse scandal, which Showtime adapted into a film. He coauthored The Confession with former New Jersey governor Jim McGreevey. He is a contributing editor for New York and has written as well for The New York Times. His documentary film How to Survive a Plague was an Oscar finalist, won a Directors Guild Award and a Peabody Award, and was nominated for two Emmys, among other accolades. His book of the same title won a Baillie Gifford Prize, a Green Carnation Prize, the Israel Fishman Nonfiction Award, a Lambda Literary award, the Randy Shilts Award, and a National Lesbian & Gay Journalist Association award for excellence in HIV/AIDS coverage. It was shortlisted for the Andrew Carnegie Medal for Excellence and the Wellcome Prize in Literature.